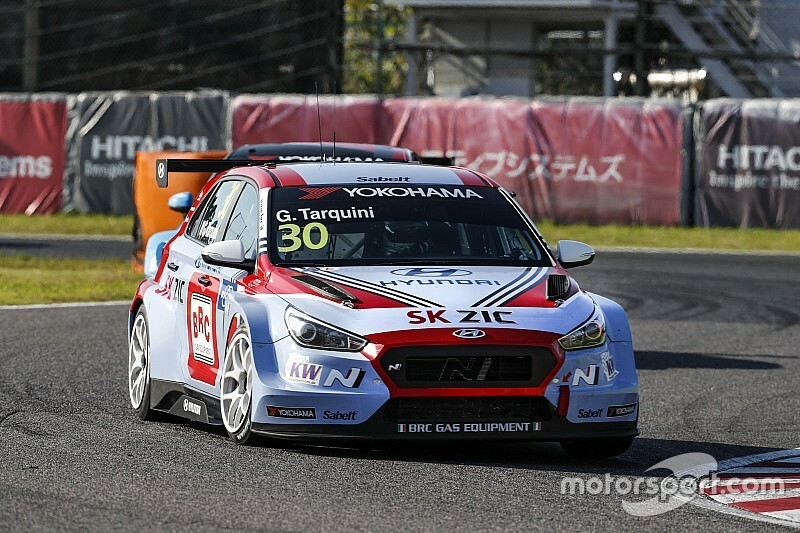 FIA World Touring Car Cup points leader Gabriele Tarquini extended his advantage with victory in the final race at Suzuka, after on-the-road winner Kevin Ceccon picked up a time penalty. Ceccon crossed the line 2.9 seconds clear of Tarquini, but a five-second penalty for being out of position on the grid dropped the Team Mulsanne Alfa Romeo driver to third place. From pole, Ceccon dropped down to fourth on the opening lap as the BRC Racing Hyundai of Tarquini seized the early initiative ahead of Yann Ehrlacher's Munnich Motorsport Honda and Aurelien Comte's DG Sport Peugeot. Ceccon had recovered to second place and was stalking Tarquini when news emerged of his penalty, which prompted Tarquini to surrender his lead and stick to Ceccon's tail. In the end the 56-year-old did enough to take his fifth win of 2018 by 1.9s from Comte, as Ehrlacher's podium challenge ended at mid-distance when his Honda slowed with apparent mechanical issues. Further back, Mehdi Benanni (Sebastien Loeb Racing VW) made a stern pass on Aurelien Panis (Comtoyou Racing) to grab fourth place on the last lap. 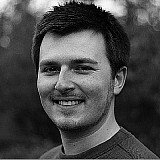 Bennani's teammate Rob Huff emerged with sixth place a further 10 seconds behind in a chaotic final couple of laps. Esteban Guerrieri (Munnich Honda) had a long train of cars formed behind, with title contender Yvan Muller (YMR Hyundai), Pepe Oriola (Campos Cupra) and Huff his main pursuers. Oriola became the first to clear Guerrieri on lap eight of 11, and the following lap Guerrieri was tapped into a lurid slide by Muller at 130R, causing the pack to bunch up into the final chicane and Muller to hit the tyre stack. Muller was forced to pull up with damage, gifting Tarquini a comfortable 39-point lead in the standings heading to Macau. Oriola would have finished sixth but was penalised for repeatedly cutting the final chicane, gifting the position to Huff. 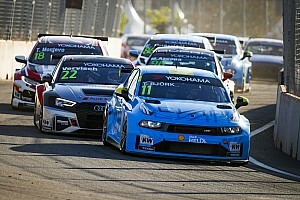 Benefitting from the chaos to move up into the remaining points positions were Frederic Vervisch (Comtoyou Audi), Thed Bjork (YMR Hyundai), Norbert Michelisz (BRC Hyundai) and Jean-Karl Vernay (WRT Audi). Tiago Monteiro (Boutsen Ginion Honda) moved up to 11th, missing out on the final point by just two tenths.